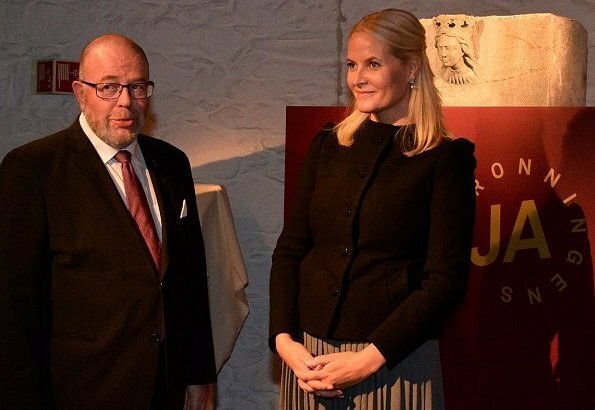 Crown Princess Mette Marit of Norway attended opening of the exhibition called "The Queen's yes" (Dronningens Ja), which emphasizes the role of queens in the medieval age. This exhibition is about the role of queens in Norway in the medieval age. The Crown Princess opened the exhibition by uncovering the statue called "Medieval Queen"
The colours suit her and I like the pleated skirt. Maybe the jacket is a bit too tight but because it's black it isn't too noticeable. It actually is both, too small and too tight! Seems that no shop in this world provides jackets that fit Mette. It's a shame! This is so stupid. We saw the same with Mary's white jacket recently without comments like this. Says it all! Why is it stupid to call an ill fitting jacket what it is....ill fitting. From what I see, I believe that this is the Prada jacket, Mette-Marit wore before. You can clearly see, that the jacket is too tight on the chest and on the upper arms, the material pulls high, sleeves are too short, the latch on the back sits too high, it should sit in the waist, or just above, here it sits almost near the shoulder blades. And last, the cut of the jacket is not ideal for Mettes body proportions, it is too short and ends just on the widest part of the hips, which would always make a person look broad. 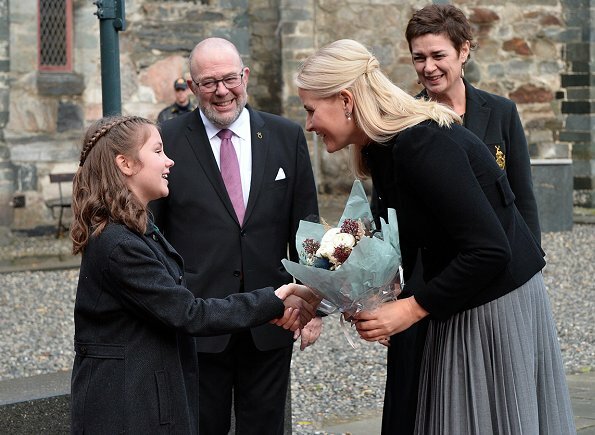 This said, I saw pictures of this event on Mette-Marits facebook site and I must say the whole look, with the pleated Michael Kors skirt, the block heels and even with the black pantyhose is a good one and suits Mette-Marit. It would look even better if the jacket would fit properly. That's all. It would be such an improvement for this blog, if people would stop to take a critical comment that sticks to the facts as a personal insult. P.S. You said Mary wore the same Prada jacket recently in white. Could you direct us to the pictures? Would be interesting to see how it fit her. And we saw excatly the same stripes and tight jacket on Mary without these comments. A tailored jacket will always look tight when they move because these jackets are made like this. Try to read what I say, not what you think I say. The difference is where Mary get praised no matter what, Mette-Marit get criticise by the same people for the same fouls.